Synopsis: The whole gang is back but when the continents start to shift it causes Manny, Diego, Sid and Sid's grandma are all split up from the rest of the herd. While floating out in the ocean they come across a pirate crew led by Captain Gutt, a monkey who's ahead of the game. But when Manny destroys Gutt's ship while trying to get back to his family, Gutt makes it his mission to get revenge on Manny and his herd. Andrew: Hello readers! Full disclosure: Sarah and I live in an apartment with no central air-conditioning. We only have one window unit and it’s in the bedroom. So the rest of the apartment gets really hot in the summer. So we decided last night was as good as any to hit the movie theatre to take use of their AC and catch a new movie! 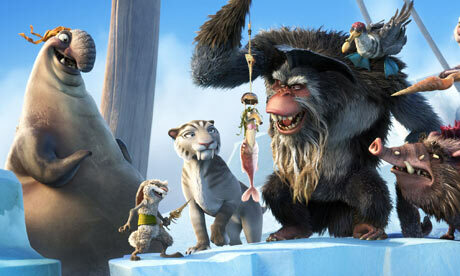 So we caught the latest installment in the Ice Age franchise – Ice Age: Continental Drift. It’s the fourth movie in the series and all four main characters are back: Ray Romano and Queen Latifah as Manny the wooly mammoth and his wife Ellie, Denis Leary as Diego the sabertooth tiger, and John Leguizamo as Sid the sloth. We have to be honest – we had absolutely NO intention of seeing this movie in the theatres. A: Until Sunday basically, because while we were lounging around the apartment trying to stay cool, we stumbled across Ice Age: Dawn of the Dinosaurs on FX and we kept it playing in the background while we read. As the movie was going we kept finding ourselves laughing at silly things every now and then. S: We found it more humorous than we had imagined we would. It was a shrewd movie by Fox because if it weren’t for FX, we wouldn’t have seen it Continental Drift in theatres. A: Which was obviously the idea, and it worked. So well played, Fox. S: I actually hate to admit that I liked this movie. 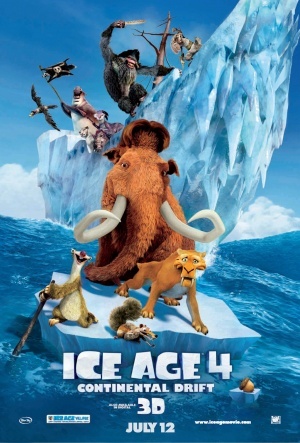 I found it entertaining, cute, light-hearted…to me the Ice Age movies are this generation’s The Land Before Time. So I find them to be cute and humorous at times. Not the whole time, mind you, but enough to be enjoyable. A: I swear I was going to make that exact comment! So since you bring that up, l’ll say that I thought the voice-acting was an obvious strength of this film. We’re not going to go in-depth into the comedy and if there was a social commentary the film-makers were trying to get across like we might with a non-animated film, but there was a who’s who of famous actors in this film and it was fun to guess who voiced which character. The one we COULD NOT pick out was who voiced the film’s villain, Captain Gutt, the monkey pirate. I had no idea who it was going in but I knew I recognized the voice, so I was pleasantly surprised to see it was Peter Dinklage from Game of Thrones. His role as Tyrion Lannister on GoT is my personal favorite character, so I was very happy to see it was him as the villain here. S: And Jennifer Lopez was Shira the Sabertooth Tiger, the first mate to Capt. Gutt and a potential love interest for Diego. Take or leave her, she wasn’t fantastic but she wasn’t bad either. It was very obvious it was her. You also had some other stars in smaller roles, like Nicki Minaj, Drake and Heather Morris (Glee) as some teenage wooly mammoths; Joy Behar in a very small role as Sid’s mother, and Nick Frost (Paul) as Flynn the Elephant Seal. Look! 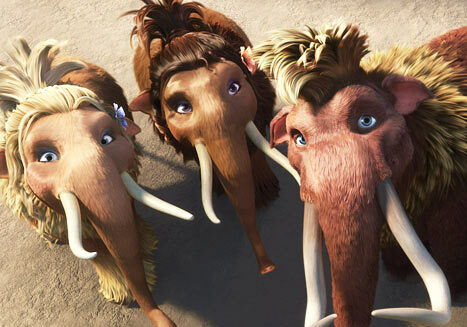 It's Heather Morris (Glee), Nicki Minaj and Drake as wooly mammoths! Obviously. A: It was a very solid cast, and I don’t want to forget Keke Palmer (Akeela and The Bee) as Peaches, Manny and Ellie’s teenage daughter. She was perfect as a teenager being embarrassed of her father and your cliche teenager things like that. S: What’s funny to me is that in the promotions and things I’ve seen for this movie, I’ve seen Nicki Minaj more than Palmer, so I thought she was going to be the daughter. A: You in particular were laughing a lot at Wanda Sykes’ performance as Sid’s grandmother. S: Oh my gosh, Wanda Sykes was my favorite character. Bar none the funniest character in the film. Her character and Sid played off each other really well. She was cracking me up. A: Let's change focus real quick and talk about it in regards to how it was for kids that might see it. Did you think it was scary at any point? S: There was one point where the main characters are floating on an ice float and come across some sirens that was kind of freaky. It might have been freakier in 3D, but we only saw it in 2D. Still, we were caught off guard. A:I honestly didn’t realize what was going on at first. You were the one that realized they were sirens, so well done there. The obligatory photo of Sarah's favorite character in the film, Sid's Grandma, voiced by Wanda Sykes. In a film with plenty of very good voice-actor casting choices, she's definitely one of the highlights. S: I knew what was going on but I didn’t expect them to look like the monsters they end up being. It has it’s thematic elements and can be suspenseful at times, but for the age of kids you’d probably take to this…kids have seen scarier I’m sure. A: Gotchya. There’s really no bad language at all, and there’s not a whole lot of juvenile humor. A: Which sounded exactly like Ewoks, by the way. But yeah, I was more into the humor like the elephant seal and his silliness. The animation was pretty top-notch, which is to be expected from this series. We're not sure how good the 3D version looks, but there were certainly some scenes early on that I assume were shot particular that way for the 3D version. But the water and icebergs and all those things looked great. Yeah, overall It’s a nice kids movie the parents would probably also enjoy. S: I would say it’s a better kids movie than The Lorax was. I was more entertained by this than I was by The Lorax. A: Completely agreed. So then what’s our final verdict? 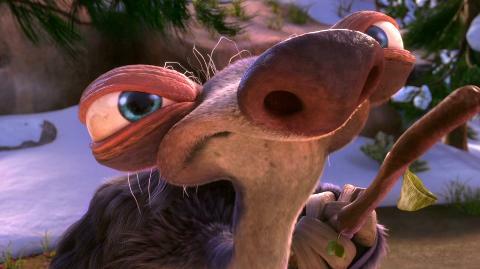 S: Ice Age: Continental Drift was good. Not great, but solid. Unless you have kids there’s no reason to see this in theatres. I might actually even just pass on it. A: Of the franchise, where would this one rank? S: I watched the second one today and it was just okay. The first one is my favorite of the series, hands down, but I would say Continental Drift is my second favorite behind the original. FINAL VERDICT: Unless you have children, just pass on it.